Over the past two weeks, in the sneakiest way possible, the Big East has become the best conference in the country. Again. The ACC was next to rise, with Virginia, NC State, and Miami all looking like top-tier contenders to stand beside Duke, Carolina, and Florida State. But those first three have all faded recently, and now a familiar story is playing out — the regular season title will come down to a Duke-Carolina game. The Big 12 has bragging rights as the conference most likely to put two teams in the Final Four (Kansas, Missouri), but beyond that, there’s a classic underachiever (Baylor), and not much else. The SEC is mostly unremarkable outside of Kentucky, and I think we’re all mature enough not to waste more cruel words on the Pac-12. But man, what a terrible collection of basketball teams, right? That leaves the Big East. According to Joe Lunardi’s latest bracketology projection, the conference has nine dance-ready schools. It includes surprise stories like Notre Dame, a team that reeled off nine straight wins earlier this month and is still the only D-I team to beat Syracuse, perennial contenders like Marquette and Louisville, resurrection stories like Seton Hall, and struggling powerhouses like UConn. But the steadiest of the bunch, hovering around the top 10 all season, has been the Georgetown Hoyas. In January, I said the Hoyas were the toughest team in the country. Coming off the well-publicized brawl in China, they were unranked and unconsidered to start the season. Upperclassmen like Jason Clark and Henry Sims gave them experience, but nobody believed that the experience was accompanied by talent. 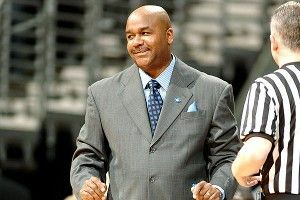 A close loss to Kansas, followed by wins over Memphis and Alabama, began to change minds, but it wasn’t until John Thompson III’s team pulled out a gutty road win at Louisville and beat Marquette a week later that people started to realize the quality of this year’s Hoyas. Georgetown now has a 12-5 Big East record and a no. 12 national ranking in the ESPN/USA Today Coaches Poll. It nearly took down Syracuse at the Carrier Dome, losing in overtime, and on Monday night the Hoyas moved to third place in the conference with an emphatic 59-41 home win over red-hot Notre Dame. The Hoyas didn’t magically gain natural ability or athleticism, and they’re still not among the elite teams in the country. Instead, this is a testament to resilience and discipline. There are other strong candidates, but for me, Thompson is the coach of the year. As the Notre Dame score indicates, the Hoyas have done it with defense. Ken Pomeroy has them as the sixth-most efficient defense in the country, and they’re in the top 5 in opponent field goal percentage (fifth) and 3-point defense (second). After Monday night’s game, Notre Dame coach Mike Brey said the Hoyas “might be the best defensive team we’ve played this season.” Against Syracuse, Thompson employed a zone defense that held the Orange to just 34.9 percent from the field, one of their lowest totals of the season. In one 10-minute stretch in the first half, Notre Dame managed just three points. A similar dry spell in the second half saw them score two points in seven minutes. To see why this happened, and to see how Brey played directly into Thompson’s hands and probably shouldn’t be considered for coach of the year anymore, let’s take a look at the most boring play diagram in history. After a missed foul shot, Notre Dame sets up the offense. Georgetown is in the man-to-man. If they wanted, they could pull out lawn chairs for the next 20 seconds. Pat Connaughton comes off a screen at the top of the key, receives the pass, and doesn’t think for a second about scoring. More time runs off. 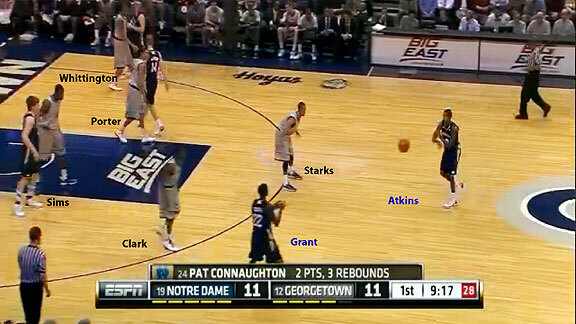 Scott Martin holds the ball for Notre Dame, letting the shot clock dwindle. As you can see, a black bear made its way onto the court during this play, but fell asleep because the basketball was too boring. Let’s fast-forward 10 seconds, when Notre Dame finally decides to initiate its offense. As the black bear continues to sleep, I suppose it’s time to make my point. 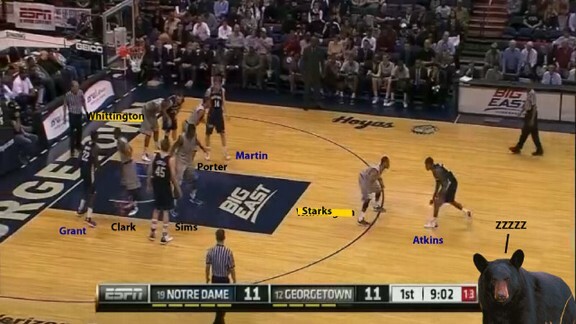 Given: Georgetown has one of the best defenses in the country, whether they choose to play man-to-man or zone. Teams have tremendous difficulty finding any openings, and are most often forced to jack up contested shots toward the end of the shot clock. So WHY, why on earth, would you ever want to stall at the top of the key against them? Before the game, Brey said he hoped the final score was in the 50s. 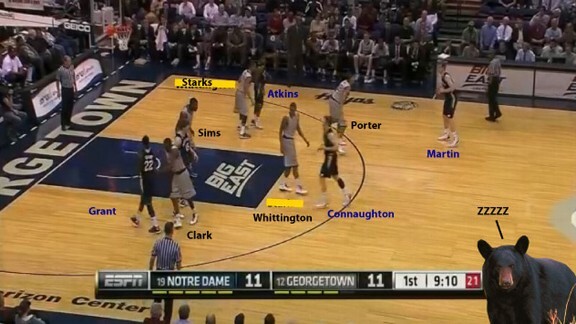 And granted, the Irish play slow (326th tempo in D-I, to 299th for Georgetown). But on the road, against a team with a far superior defense, is it really wise to play right into their hands and give yourself just 10 seconds to score? What kind of a quality shot do you hope to produce from that strategy? One more thing: When people rush to the defense of slow basketball, or the 35-second shot clock, they tend to use the argument that an offense is subtly picking apart the defense. As in, they need all 35 seconds for the intricate machinations that result in a basket at precisely the end of the shot clock. Nonsense. As you see here from Notre Dame, all that happens is that slow teams hold the ball for 20 seconds until they decide to run a play. There’s no reason the Irish couldn’t have initiated something 10 seconds sooner. Here’s the truth: they use the clock because it’s there, not because they need it. They don’t do anything special with the time. This is why scoring is the lowest it’s ever been in the shot clock era, and lower than it was in most of the non-shot-clock era too. And you’re telling me we shouldn’t at least move the clock down to 30 seconds? Let’s see what the offensive plan produces, aside from 41 points in 40 minutes. 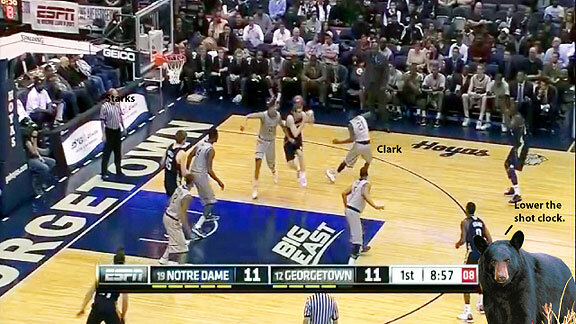 Martin has to force a drive from the baseline, and Clark reaches in to strip the ball. The bear learned to speak English and wants to lower the shot clock. Otto Porter collects the loose ball, races downcourt, and hits Markel Starks for a go-ahead layup. 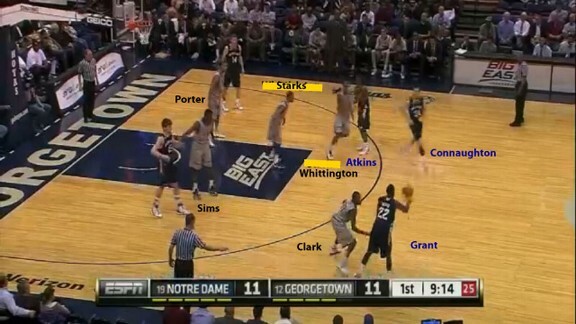 The 11-all tie was the last time Notre Dame would be anywhere near Georgetown for the rest of the game. Thompson had thoroughly outclassed Brey, and the Irish needed a desperation bucket in garbage time just climb out of the embarrassing 30s. What awaits Georgetown? Hard to say. The tournament future is uncertain, since traits like discipline and toughness only go so far in the face of a team like Kentucky. At the same time, teams with upperclassmen have a distinct advantage in the tournament, where experience matters. A lot, as ever, will depend on the draw. But whatever else happens, Thompson’s club has been the surprise of the college basketball season. With a win at Marquette this weekend, they could even finish second in the best conference in the country. If that’s not coach-of-the-year material, then I’ll be one angry bear.